Enjoy another walk on the MILLENNIUM WAY, only a short stretch but a chance to savour the delights of this long distance trail. 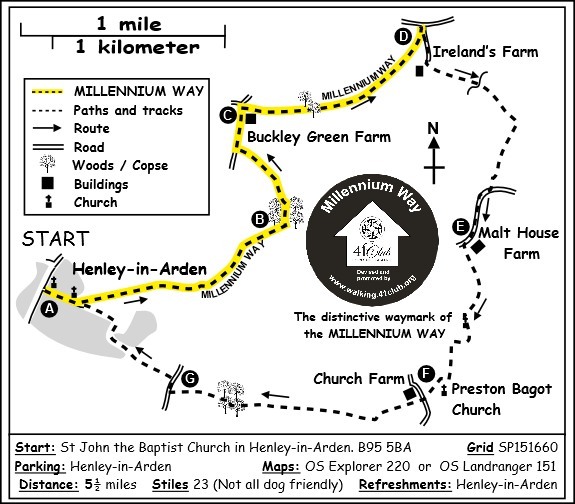 The MILLENNIUM WAY section is clearly waymarked with the distinctive black Millennium Way circular waymarkers. Find out more about the walk by clicking on the information icon. This delightful 5 mile circular walk starts from the 15th century church of St John the Baptist, situated on the corner of the High Street and Beaudesert Lane in Henley-in-Arden. (It is usually possible to park for up to 4 hours at the top of Beaudesert Lane but please check the restrictions). 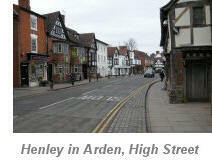 There are several pubs & restaurants in Henley-in-Arden at the end of the walk. From St John the Baptist Church go up adjacent Beaudesert Lane, over the bridge and past the Norman church of St Nicholas on your left to find a kissing gate giving access to footpath leading up the hill to what is known as `The Mount´. You will not find any obvious ruins but this is the site of the Motte & Bailey castle built by Thurstan de Montfort, Lord of The Manor in the 12th century. 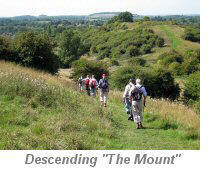 As you ascend you have a fine view over the town and surrounding countryside. From the top of The Mount descend some fairly steep steps then continue initially downhill, then uphill on the highest path eventually reaching a welcome wooden bench and passing beneath small overhead powerlines. Ignore stile on your right and continue ahead following the Millennium Way waymarker. Here we continue along the ridge with hedge right and glorious panoramic views to your left. Continue ahead on a narrow path then take the waymarked stile on your R and go diagonally half left to stile at field edge. Cross stile turning left into small wooded area. At junction of paths go ahead remaining in wooded area - the path weaves through to exit by a stile / wooden gate left . Go slightly left, keeping hedge left, to come to ridge with fine views. Go diagonally downhill to find stile between two corner metal gates at corner of field. Take stile ( or gate to the left, if open ) and go across field centre to find stile adjacent to gate leading to path alongside gate entrance and then parallel to the lane to find fence gap. 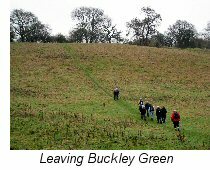 Take gap and go right on lane for about ¼ mile passing Buckley Green farm on your right. At the `T`junction take the road right and after 15 paces take kissing gate right. Continue up field keeping wooden fence on right to corner field kissing gate. Take wooden kissing gate and go straight up steep hill to take corner kissing gate then following Millennium Waymarker go through copse and exit by stile to field. Continue ahead straight across field to find corner kissing gate. Take gate then ahead with hedge right to follow around field edge to take metal kissing gate right. Go left to take next gate just ahead and turn right across field corner to tree line, then go left with trees right. Watch for farm building right and come to driveway. Go right 10 paces on driveway and immediately left gently uphill along grassy path signed Millennium Way. After some 150 paces (by double power posts) veer slightly left to find field edge. Go up field edge keeping to left of metal barn to pass under power cables and at top right field corner by the copse go right to find hedge gap to Ireland´s Farm driveway. Turn right down farm driveway towards Ireland´s Farm. At this point you are leaving the Millennium Way. Continue down farm track to go under the power lines, eventually coming to Ireland´s Farm. Just before farm gate turn left to descend down grassy track continuing ahead through a metal gate, cross field then over a stream and stile. Bear slightly right of telegraph wires up field, then cross a stile and turn right onto farm driveway to proceed over dismantled railway line ignoring footpath left.. Continue along driveway in a southerly direction until you reach the road. Turn right at road, crossing the bridge and continue along lane for approximately 300 yards to reach Malt House Farm on the left. Immediately after Malt House Farm take the signed footpath left through large wooden gate. Continue ahead through smaller wooden gate and proceed gently uphill with hedge left. Go over corner stile then half right across field continuing with hedge and trees right towards corner of field. Take stile, then over further stile right. Continue ahead on grassy path with hedge right & paddock on left. Go through metal kissing gate & turn immediately left, then take next kissing gate into field, continuing ahead with hedge left. Keep ahead through further gate and proceed towards Preston Bagot church, an ideal spot for a short break and some refreshment. The original church was built in the late 11th or 12th Centuries on Anglo-Saxon foundations and most of the original structure survives. Do visit the church before continuing the instructions at F.
With your back to the church entrance door, go forward to exit the churchyard by the gate, then turn immediately right and walk along to take the wooden kissing gate nestling under a large oak tree and descend the narrow track down to take wooden kissing gate to the road, then cross into field opposite via metal gate. Continue through next two metal kissing gates and go up field keeping hedge right. Take the next kissing gate and go directly across centre of field to exit by further kissing gate 20 yards in from field corner. Ignore the kissing gate immediately to your right and continue ahead with hedge on right for 100 yds where you will find a corner kissing gate to exit into a small wood of young trees. Continue ahead with tall hedge right and exit by corner wooden stile keeping ahead with hedge right and exiting field by wooden stile. Cross the next field via stile turning right to walk through small copse exiting by wooden stile. Continue ahead with hedge to right going through a metal gate followed by two further stiles and continuing with hedge right then over exit stile to emerge onto a lane. Turn right onto lane and after 15 paces turn left across stile continuing ahead with hedge right taking the stile right in corner of field then immediately left over further stile descending steps through a wood. Emerging from wood we enter school playing area taking the small metal gate onto a tarmac track down to road. Go across road and along path, following metal fence on left by side of school play area. At the corner go across wooden plank bridge then through kissing gate to go left along path keeping hedge left to eventually reach a metal gate on your left. Take gate into Beaudesert Lane to arrive back at Henley. Henley’s mile-long High Street is a conservation area with several interesting buildings. Next to St. John the Baptist church is the 15th C timber-framed Guildhall. Its collection of civic relics includes furniture, pewter plate (1677), maces, manorial rolls and the 1449 charter that granted privileges to Henley. The Guildhall and its walled garden can be viewed on application to the custodian at the Guild Cottage. Beaudesert church, the Norman church just before The Mount has a beautiful doorway. Stand inside the church and look at the altar. Notice that the chancel arch is offset. This was because the north wall of the church was built over a spring and had to be rebuilt further south. Once an imposing Norman motte and bailey castle on The Mount, it was in ruins by 1547 and entirely gone by 1656, the stone probably being reused to repair Warwick Castle. A Time Team dig in 2001 revealed much about the structure. 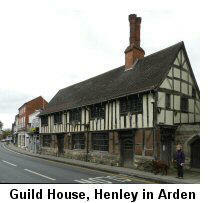 A video of the dig can be seen at the Henley Heritage Centre, next to the famous Henley ice-cream shop. Buckley Green Farm is a 17th century timber-framed farmhouse, grade II listed. Ireland’s Farm was formerly Lapworth Hall, the manor house for Lapworth, and in the 17th and 18th centuries the house of the Mander family (of paint and varnish fame) of Wolverhampton. 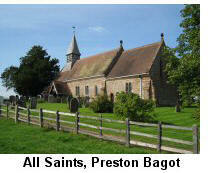 All Saints Preston Bagot has one of the best panoramas of any church in Warwickshire. Dating from the 12th century, it fell into ruin when the church at Beaudesert took over the parish. In 1878 the architect J. Chatwin decided to save it and it was almost entirely rebuilt and enlarged. Chatwin employed the then fashionable Pre-Raphaelite artists William Morris and Edward Burne-Jones to create the stained glass windows. The distinctive bell-turret was added in 1879 to hold the bells which had formerly hung in a yew tree at the west end of the church.